​Our office is located right off of Amwell Road in the plaza “Courtyard at Amwell”. 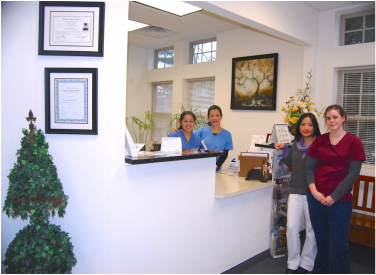 Here at Precision Dental, our staff works diligently to make patients feel comfortable and provide them with quality care. Our staff is both friendly and experienced so that the patient can communicate effectively in order to receive the best care possible. grafting techniques. His priority is holistic dentistry with an emphasis on overall oral health rather than focusing on only the treatment plan. As part of his holistic approach, Dr. Yang prefers conservative treatment plans. He sits and listens to each patient before describing every treatment option available to them. This allows the patient to make a well informed decision about their teeth. While preserving the health of the teeth, Dr. Yang also takes cosmetic dentistry into consideration during restoration procedures. The result is healthy and beautiful teeth. Our office uses state of the art technology for diagnostic and documentation purposes such as digital x-rays and paperless charts. These tools allow us to make the best possible decision for your oral health as well as make our office eco-friendly. We also implement a thorough sterilization system for all our dental instruments which eliminates contamination. We accept all major dental insurance plans as long as they are PPO. Please call us to schedule an appointment and feel free to ask us any questions that you may have.